If you love the smell and taste of smoked meat, then its high time you invested in the best digital electric smoker. Not only will you be able to continue tickling your fancy (smoking meat) but you will infuse your food with smoke flavor from different woods. The process of smoking meat was first used by our ancestors with the purpose of preserving it for a long time. Today, digital electric wood smokers are used to add special flavors to all kinds of foods for example vegetables, chicken, fish, ham, jerky, cheese and nuts too. Apart from the special flavors, smoking your food helps to add a highly desirable mouth watering flavor too. The most common material used for constructing digital electric smoker walls is stainless steel. The material is corrosion free and can withstand high temperature levels. When insulated, it allows you to smoke on a hot or cold day plus it can withstand exposure to outside elements. Digital electric smokers are powered by electricity that heats an element which in turns burns the wood chips. This is how smoke is produced. Look for a model that comes with an automatic wood chip loader, a good smoking system and enough power. For food to be ready, it has to be prepared at a certain temperature. 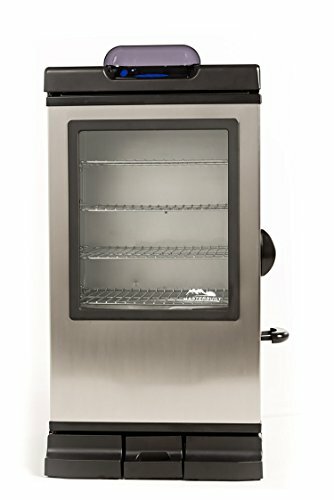 When shopping, looking for a smoker with a great temperature control. This allows you to monitor different levels. It should also have a wide range to allow you to prepare a wide variety of meals. Majority of smokers come with 4 racks made with stainless steel and coated with chrome. The more racks your smoker has, the more food you can prepare thanks to the large cooking space. Hygiene is important as this eliminates the growth of mold and development of breeding grounds for pathogens. The best smoker should have removable water and drip pans to allow for easy cleaning. This helps to keep the smoker clean. 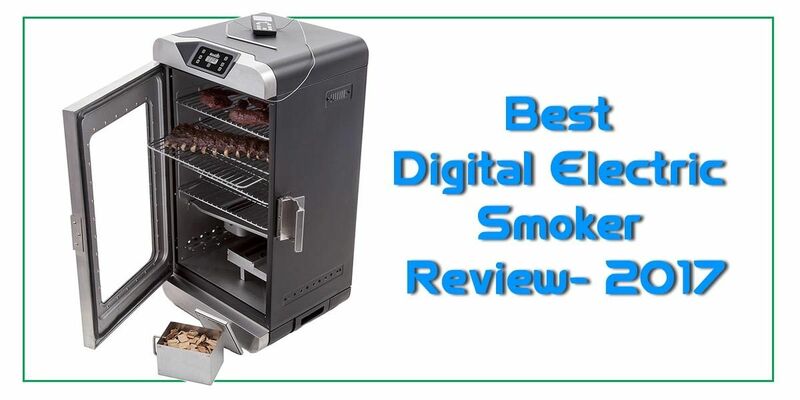 Here are the reviews of the best digital electric smokers available in the market. The award winning Masterbuilt 30-Inch Black Electric Digital Smoker is designed with 730 square inches of cooking space which is enough to smoke meat, vegetables and other foods. The spacious inside fits four interior smoking racks that provide ample room to smoke ham, fish, sausage, chicken and jerky. The smoker is powered by an 800 watt heating element which powers up when the unit is connected to an electric source. It comes with an easy to use side wood chip loader. This eliminates the need for opening the door in order to add more wood chips. All you have to do is fill up the loader with wood chips, slide it in and wait for your food to be smoked. It comes with an intuitive push button digital control panel making it easy to operate the unit. The control panel has temperature settings that range between 100 to 275 degrees F. The smoker’s walls are insulated making the unit to be energy efficient. Has a digital control panel making it easy to operate. Has a simple wood chip loading system. Available with 730 square inches of cooking space. Lacks a transparent window that would provide a view of the smoking process. The temperature range makes the unit unsuitable to prepare foods like poultry. Bradley Smokers are designed with cutting edge technology that offers users with the best in smoking technology. As the best digital electric smoker, it comes with the same features available in the Bradley Original Electric Smoker. It has a digital interface which allows you to set the oven temperature, oven timer and smoke timer. Once the settings have been configured, you can rest and let the smoker perform its duty. It has an automatic advanced loader technology that feeds bisquettes into the burner every twenty minutes. This enables the unit to smoke for the perfect amount of time finally giving the food pure smoke flavor. The loader has a capacity of 8 hours worth of bisquettes. It is engineered with an insulated stainless steel interior which allows you to smoke on hot and cold days. This is done while the unit maintains the desired cooking temperature. The insulated interior has a high capability of heat retention plus it’s easy to clean up. It has four fully supported removable racks that provide easy accessibility without the need of tipping. The separate smoker and oven burners generate smoke and heat. It’s able to hold up to 8 hours of smoke. Features an insulated stainless steel interior with heat retention. Comes with a one year warranty. Designed with a digital interface. Has an advanced bisquette loading system. The maximum 280 degrees F is unsuitable for preparing different foods. Limited information on warranty coverage. It features premium insulated double wall construction which locks in heat and smoke. This helps to improve food preparation times. Thanks to the hassle free construction, the smoker is 10 times more efficient with wood chips. It allows you to fill the 4 cup capacity wood chip box producing 7 hours of smoke. It comes with a washable and removable integrated meat probe which takes the guess work out of smoking. All you have to do is insert the probe into the meat and you will be alerted once it’s cooked. It features 725 square inch capacity with 4 adjustable removable racks that allow you to prepare foods like ham, sausages, meat, vegetables and fish. A side locking latch for smoke tight seal improves the flavor of the food. You can finally cook your meals to a juicy, smoky and tender perfection. The control panel has an easy to read blue LED display making it convenient to monitor and operate. Has a warming feature that helps to keep your food warm before serving. Features a large locking latch that seals in smoke and heat. The digital programmable controls make it easy to operate. Has an 8.5 cup high capacity grease tray that makes grease removal and cleaning hassle free. Comes with built-in wheels and handle for mobility. The digital LED display may be ineligible during daytime. Does not have an automatic wood chip loader. If you were searching for a simple and smart digital smoker for your home, then you have finally found it in the Masterbuilt Bluetooth Smart Digital Electric Smoker. As one of the best digital electric smokers, it’s integrated with Bluetooth technology allowing you to control the product with your smart device. It comes with a built-in meat probe thermometer that alerts you when meat is cooked at a pre-determined temperature. Thanks to four chrome coated smoking racks, you can prepare a wide range of foods from ham to fish. The racks are fitted in 721 square inches of cooking space. It has a rear mounted handle with built-in wheels which makes transportation to be easier. The side mounted wood chip loading system enables you to load wood chips without the need of opening the door. It has a front access grease tray which provides quick access to the grease and ensures clean up is easy. Can be controlled via Bluetooth by a smart device. Has a rear mounted handle and wheels for easy mobility. Comes with an air damper for better smoke control. The removable water pan helps to infuse moisture in meat. Has a built in probe thermometer that alerts you when meat is ready. You cannot connect two or more smart devices via Bluetooth to control the smoker. The 275 degree F is unsuitable for preparing foods like poultry. 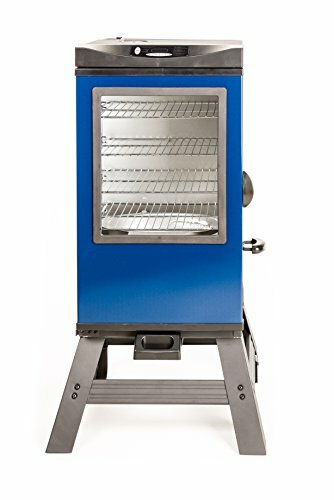 The Masterbuilt 4-Rack Digital Electric Smoker has four chrome coated smoking racks which provide much space to smoke and cook 80 pounds of food. The racks can accommodate foods like vegetables, fish, sausage, ham and others. 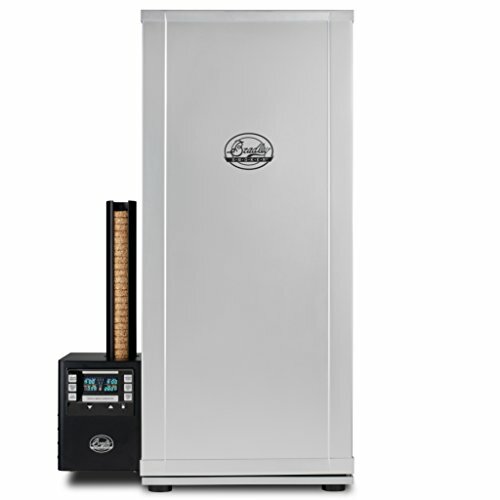 The digital smoker has the ability of smoking food up to 275 degrees F. It features an 800 watt heating element that burns the wood chips and generates the much needed smoke and heat. It comes with an RF remote that controls temperature, time, food light and monitors the meat temperature too. It can also turn the appliance on and off. It has legs which add 10 inches of height providing easy access for the user. The unit comes with a smoke cover designed to protect the outer shell and electrical components from water and dust. Carving gloves are available too and they help to protect the user. A 25 recipe cook booklet full of smoking dishes allows you to prepare a wide variety of dishes. Can smoke 80 pounds of food thanks to the four chrome coated smoking racks. Has an 800 watt heating element that heats up wood chips to generate smoke. Designed with legs that raise the product 10 inches from the ground. Comes with an RF remote that controls different settings like temperature, time and food light. Does not have a non stick interior. When you shop for the ideal electric digital smoker, there are a few features you have to look out for. The number of racks, wood chip loading system, insulated double walls, remote control, digital interface, size, capacity, built-in wheels, integrated handles, meat probe and a locking mechanism. 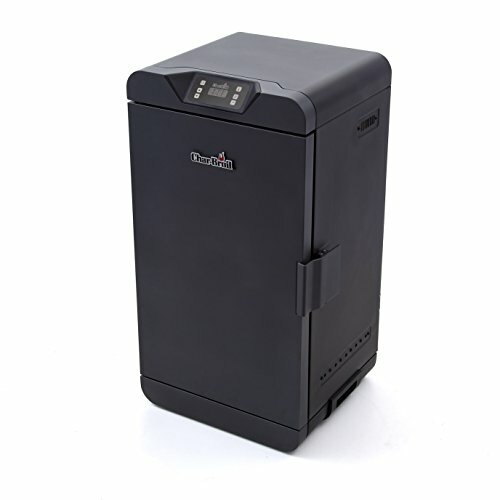 Planning to shop for an electric digital smoker anytime soon? 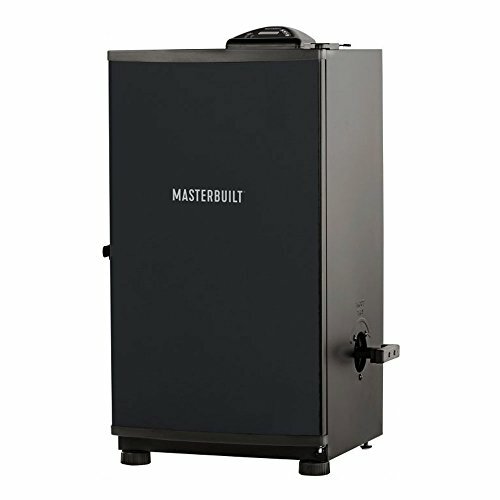 I highly recommend the Masterbuilt 20070910 30-Inch Black Electric Digital Smoker. Copyright text 2018 by Kitchen Gear Reviews.